This is one of the least-traveled areas in all of Asia, and therefore a region of the world where time has largely stood still for the many unique and varied tribal cultures. This tour is certainly not for a first-time visitor to India, and it will be very busy and active, but those intrepid traveled will be rewarded and guaranteed a truly electrifying and unforgettable journey in one of the planet’s most unknown, fascinating and obscure regions. 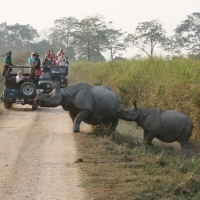 Search for wildlife on elephant back and by jeep around Kaziranga National Park with its one-horned rhino population, 70% of the world population of the Eastern Swamp Deer and 75% of the world’s wild Asiatic water buffalo. Arrive in Guwahati where you will be met and driven to Kaziranga (230km/4-hours). to the stunning Kaziranga National Park. A paradise for the greater one-horned rhino, as well as a haven for birders, the area comprises of 860 square km and is rich in flora and fauna. It is one of the places with the highest population density of the Royal Bengal Tiger, Asiatic elephant, Asiatic Wild Buffalo and Swamp Deer. Other species include sambar, hog deer and hoolock gibbons. We will check into our lodge, our base for the next two nights, and go for a leisurely walk along the banks of Diphlu River. On our second morning, we will rise early and head to the entrance of Kaziranga, where we will take a safari on elephant back through the Central Range area of the park, which is very good for mammal sightings as well as birds (Blue-bearded Bee-eater, Great Hornbill, Rufous Woodpecker). After lunch we will begin a jeep ride in different range of the park. 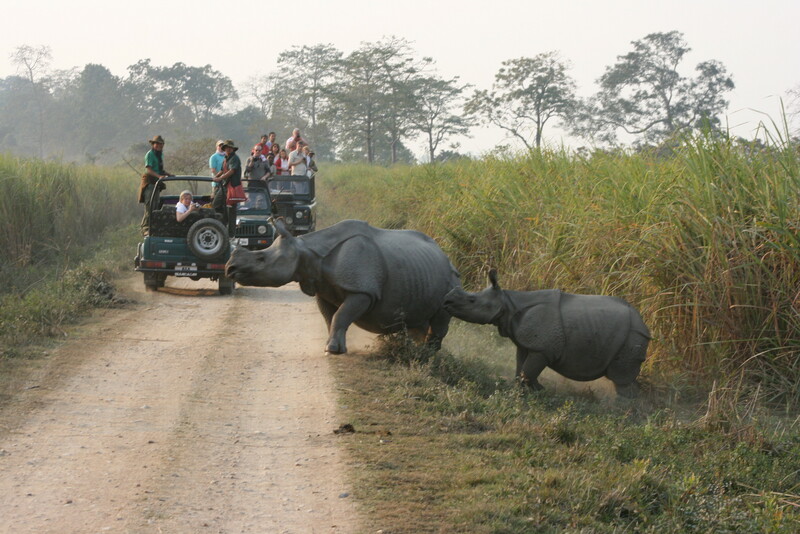 The Western Range has the highest density of rhinos, as this part is swampier with extensive Haemarthia compressa stands. It is also good for grassland birds and raptors (Swamp Francolin, Pallas’s Fish-Eagle). Smooth-coated otters are sometimes seen fishing in the ox-bow lakes. The Mishing are the riverine plain tribes of Assam, which is the second largest group of scheduled tribe of the state. As a riverine tribe they construct their houses on stilts about five feet from the ground which is about 30 – 40 meter in length. In the evening we walk around a nearby Mising village. Overnight in Majuli Island. Today we will spend a full day around Majuli, where we will visit villages known for pottery and mask making. We will drive to visit the ‘satras’ and interact with the monks and may get the opportunity to also witness a satra dance performance demonstrated by the monks. Later we will also explore around the shoreline in a boat to view birds and see the sunset on the river. Overnight in Majuli Island. We will explore the Ziro valley by visiting the villages of the Apatani tribe. 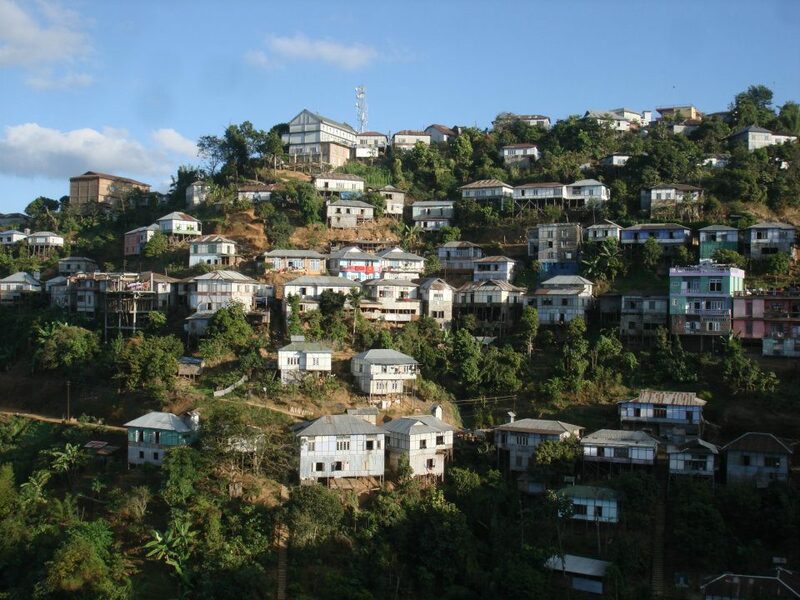 When walking through the streets of Hong, Hija, Bula, Hari or Duta we will see the rows of terraced houses and meet the locals to learn about the people and their customs. The highlight of the day will be arts and craft – The Babo and lapang, the totem and animist ritual sacrificial altars and totem poles, the cane backpack, the head gears of Apatani tribe. Later we will visit a local museum and emporium. Overnight in Ziro. This morning we will begin our long journey to Daporijo (160km / 7 hours) where along the way we will visit the remote Hill Miri and Tagin villages, the main tribes of this area. The Tagins are very volatile and independent people, and had a history of massacring outsiders (the last of which was in 1953). They are known to grow tobacco and are habitual smokers as well as expert hunters and use poison from plants for arrows. Selling of land is considered taboo, as they believe the presiding spirit is likely to be annoyed and bring misfortune. On arrival in Daporijo, and after dinner, we will have the evening at leisure to relax or stroll the town after a full day. Overnight at the Hotel Singhik in Daporijo. Today we will be heading to the land of the Adi tribes, meaning “hill man” or “man of hill”, is one of the largest tribes of Arunachal Pradesh and a very prosperous tribe who still prefer to live in traditional broad huge houses made of bamboo, cane and wood and the are known for their unique architecture and designs. The religion of the Adi is centered on Donyi-Polo, the Sun-Moon god, who is regarded as the eye of the world. They believe in the world of spirits, and perform ceremonies to appease malignant ones to ward off the evil. Aalo is set amid a brilliant surroundings with impenetrable forests, wide rivers, deep gorges, beautiful villages and a plantation. Overnight in Aalo. Today we start our journey to Dibrugarh, known as the “Tea City of India”, where along the way we will cross the mighty Brahmaputra River by ferry, one of the major rivers of Asia. Overnight at the Mancotta Tea Bungalow in Dibrugarh. After breakfast we will drive to Sibsagar, the old capital of the Ahoms who ruled Assam for 600 years before the arrival of the British into these parts. 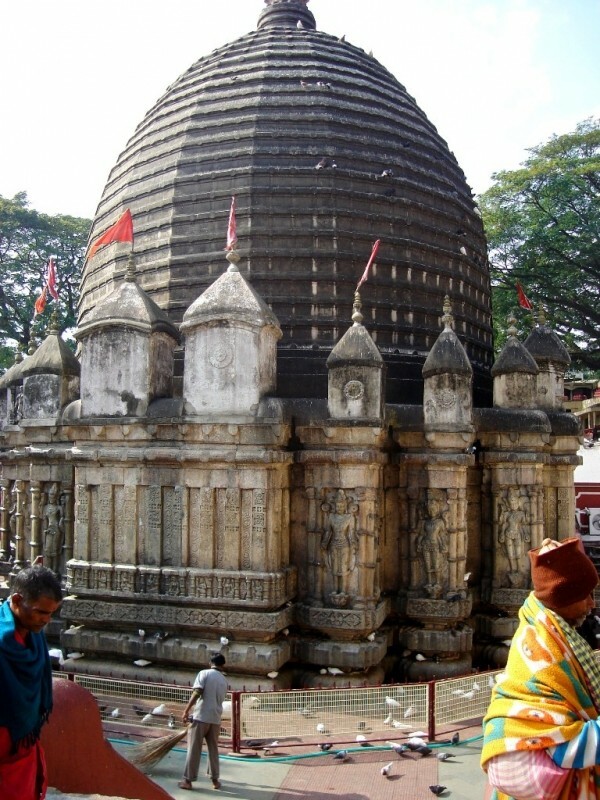 A number of old monuments built by them remain; the most significant being the huge man made tank ‘Sibsagar’ from which the town got its name. 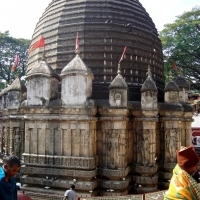 We will also visit Shiva Dol – a popular temple with a nearby tank build during the Ahom reign. Later we will continue on to Mon. 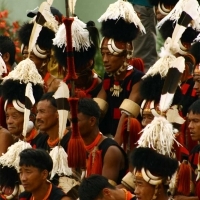 This district is inhabited by the Konyak tribe, who are are seen as the most traditional of the sixteen Naga tribes. They have given up their head-hunting ways, but still lives in a very traditional lifestyle. Overnight at the Paramount Guesthouse in Mon. We will head towards the border of India and Myanmar to Longwa. The traditional lifestyle still prevails in this village. Konyak are adapt artisan and skilled craftsman; here you can find excellent woodcarvings, guns and gunpowder, head brushes, necklaces and other bead ornaments, bone carvings, and tribal weapons such as decorated machete, muzzleloader guns and spears. Overnight at the Paramount Guesthouse in Mon. After breakfast we will head to nearby villages of the Ao Naga tribes, where we will visit the Ungma, Longkhum and Settsu villages. Racially the Ao Nagas are Mongolians, therefore all Mokokchung villagers are Mongolians and is believed to have migrated from the Far East. 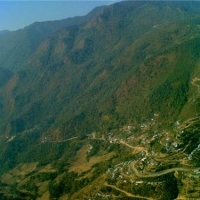 There are five clans within the village — Pongener, Longkumer, Jamir, Atsongchanger and Kechutzar. Overnight in Mokokchung. A long and interesting day is ahead today as we journey to Kohima. En route we will visit the villages of the Angami Naga in Touphema. 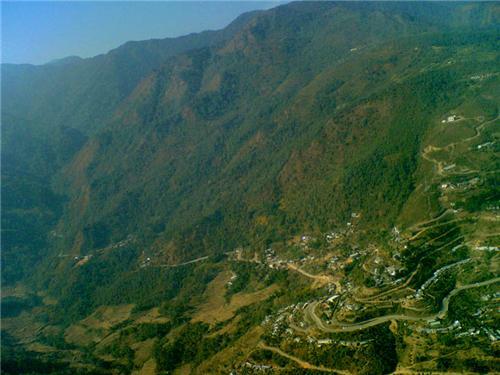 Kohima is perched at an altitude of 1444 above sea level, a pretty and unspoiled hill station, with panoramic views of the rugged Naga Hills. 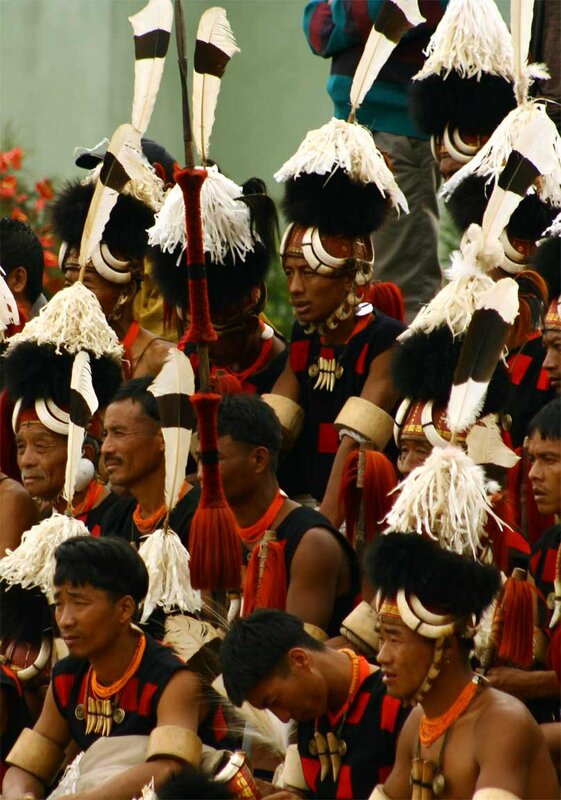 It is the land of the Angami Naga tribe, which is one of the major tribe in Nagaland. Angamis were traditionally warriors, and in the past the Angami men spent majority of their time in warfare with hostile villages and taking heads. 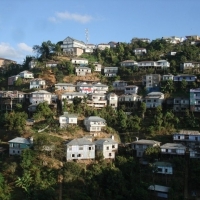 Kohima had witnessed the fiercest fighting during WWII. Overnight in Kohima. We will begin our morning with a visit to Khonoma village and the war cemetery. Later we will spend the rest of the day enjoying the exotic Hornbill Festival. Overnight in Kohima. After breakfast we will begin our long journey to Loktak Lake, which is the largest freshwater lake in India and is known as the only floating lake in the world due to the floating phumdis (which is a mass of vegetation, soil, and organic matters at various stages of decomposition) on it. Because of this unique feature, this is also home to the endangered Sangai or Manipur brow-antlered deer. In the evening we will enjoy the beautiful sunset over the lake. Dinner and overnight at the Sendra Resort at Loktak Lake. Today we visit the Keibul Lamjao National Park (the one and only floating national park in the world) early in the morning to have the best possible chance in sighting the highly endangered Sangai Deer – also known as “Dancing Deer of Manipur”. Later we will visit Indian National Army (INA) Museum in Moirang before boarding our boat to explore the various parts of Loktak, especially the people living on phumdis, and also visit Karang – a lake island village where we will explore the life and traditions of the local people. Overnight at the Sendra Resort at Loktak Lake. In the morning we will head to the village of Andro, one of the oldest in Manipur, where we will visit the Cultural Heritage Complex. Here the practice of fire worshiping is still continued in the temple of Panam Ningthou. It is prepared in turn by every house-hold member of the village. The community of Andro has occupied a major portion in the map of traditional pot making culture. They still preserve the traditional rituals and norms relating to the process of pot making. Moreover, the villagers are nature loving people and always maintain a good relation with nature to keep a pollution free ecosystem. In brief, we can call the village as the living heritage village. Interact with the villagers and see pottery making. Return to Imphal. Time permitting also visit Kangla Fort. Dinner and overnight in Hotel.